I’ve presented this chart before, with a bull-market target at 27,251. If the Dow had gotten within 5-10 points of this Hidden Pivot and begun to fall, I’d have treated the weakness as the almost certain beginning of a major bear market. What happened instead was that buyers sputtered out 300 points shy of the target. Initially, this led me to expect one last charge higher. But with the sharp decline we’ve seen in October, odds have grown that a bear market has indeed commenced. Even so, you can see that a further fall to perhaps 20,000 would not alter the very bullish look of the big picture. Imagine a descending price bar reaching into the low 20,000s or high teens, and it would be easy to infer that such a move was not just corrective, but overdue. 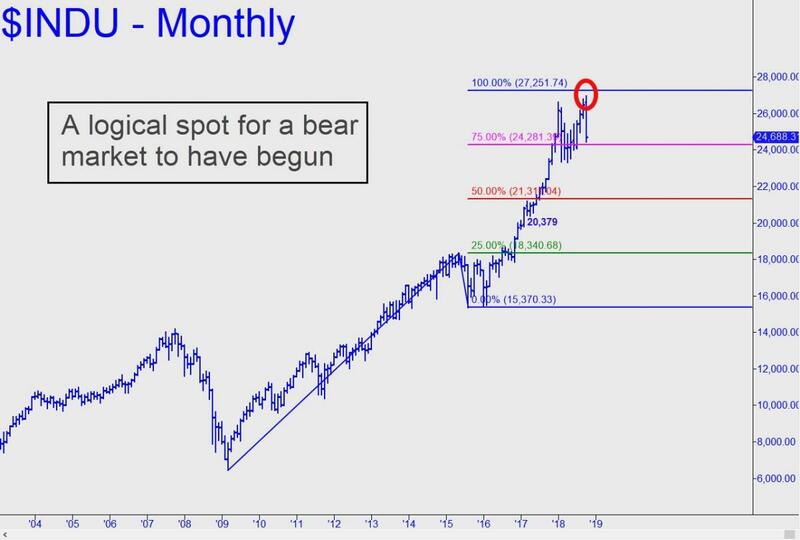 From a Hidden Pivot perspective it would not become bearishly impulsive on the monthly chart until such time as the tiny but still significant ‘external’ low at 20,379 is exceeded to the downside. Many market observers, especially permabears, would be saying at that point that the end of the world was nigh. But I am writing these words as much for you as for me, a reminder for later that if and when the Dow has fallen by 4,000-6,000 points, this could mark the completion of a correction within a bull market destined for much greater heights than we’ve seen so far.